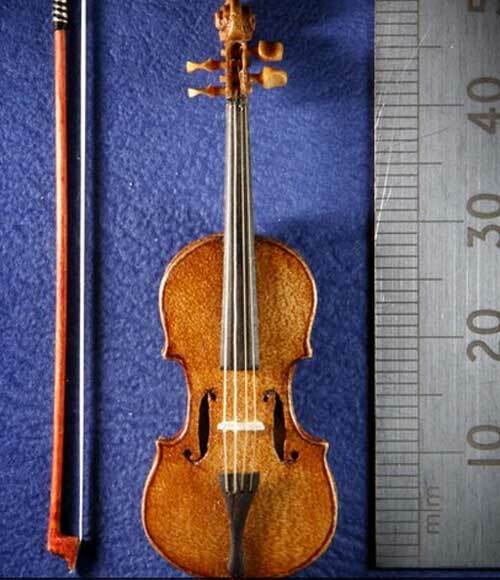 This miniature violin is a work of art in itself. A full showcase of David Edwards&#39; work will be on show at the Kensington Dollshouse Festival on 3 December. David used to play for the Royal Scottish National Orchestra, but gave up his career as a professional cellist to make miniatures for doll&#39;s houses. 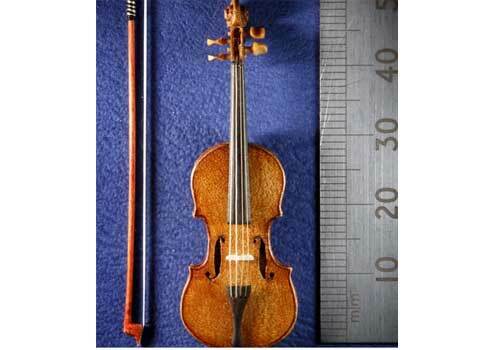 He says he has made dozens of his 1/12 size &pound;1,000 violins, based on a Stradivarius. "Being a musician has helped me," he says. "Musicians have a lot of concentration, not just for normal concerts but for something like Wagner&#39;s Meistersingers - five hours or whatever it is - there&#39;s a lot of concentration involved." David says that he does very few of these shows, which are all over the country, but Kensington is about the best in the world and he comments that it is very, very prestigious. "You can&#39;t go into it, you have to be invited and I&#39;ve done that for a long time," he says. David has travelled all over the world with this marvellous piece and his wife, Roslyn, is always with him. "She helps me a lot at shows. British miniatures, as far as I&#39;m concerned, lead the world," he finishes.